Hello Everyone!! Another Monday has arrived. Can you believe there are only 17 days left until Christmas?! I am already starting to feel the pressure of Christmas shopping and getting everything done on time! What about you? 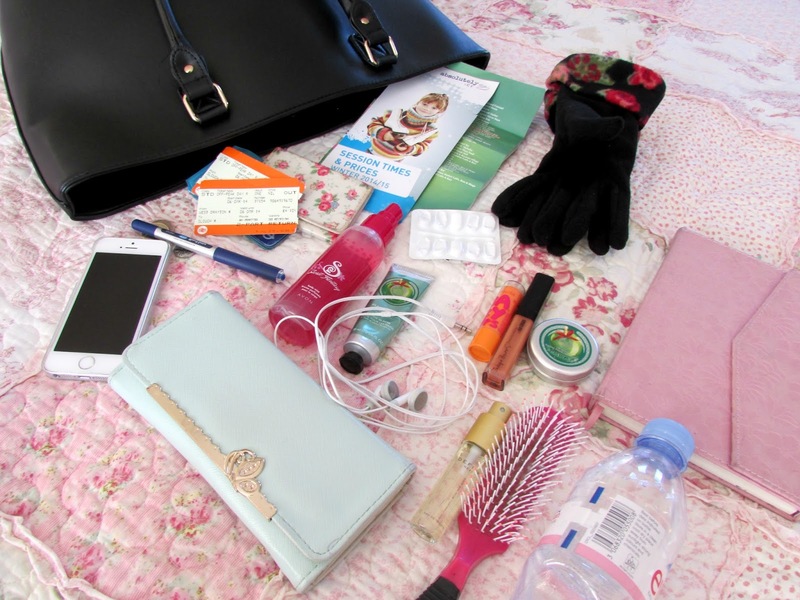 But anyway, before I ramble on to much today I thought that I would do an updated 'What Is In My Bag?' post. The last time I did one of these posts was back when I first started this blog early last year. You can read that post HERE. 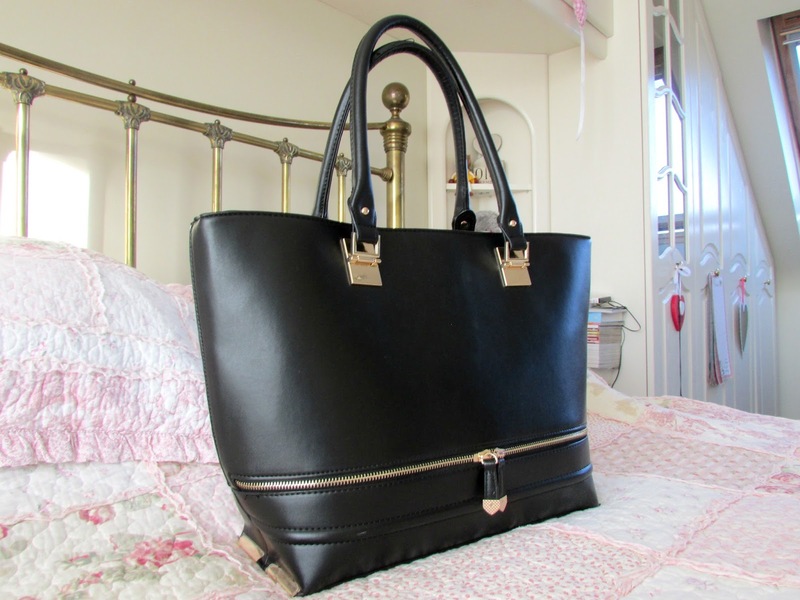 As you can see from the photos, the bag that I am currently using is the Black Double Zip Tote Bag from New Look. It is priced at only £24.99 and is absolutely amazing. I've been looking for a bag like this for a very long time but never seemed to find the right one. It's big enough to store all my stuff in and if you have little bags when you are out shopping you can just pop them in here which makes the shopping experience a lot easier. Before I get into everything I've currently got in my bag I'd just like to say that I haven't added anything. 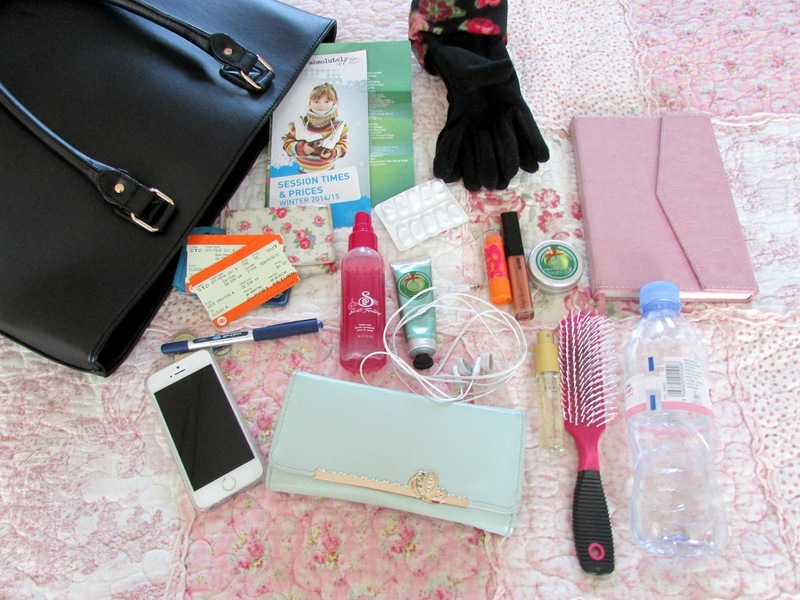 This is everything that was in my bag when I opened it to do this post. I have thrown away old receipts and tissues and stuff just to make the viewing experience easier on you so I hope you don't mind that. There isn't anything that exciting in my bag as you can see but I know people like a good old nose, me included! Iphone 5S - So that I can update my twitter and instagram and also listen to music on the go. Oyster Card/Train Tickets - Permanently in my bag as I live in London so it's a must. The train tickets are from when I went to Slough a couple of days ago. Purse - I bought this purse when I was in Turkey. The color is beautiful & it's perfect for all my cards and cash. Journal & Pen - I love keeping a journal but I have to take it everywhere with me. I just don't like leaving at home. There's a lot of personal stuff in there that would kill me if anyone was to just open it up. Hair Brush - To tame my knotty mane when I'm out and about. Headphones - For use with my phone or iPod (which is not pictured as I'm using it to listen to music as I type this post up. Avon's Secret Fantasy Spray/Next Perfume - Just so I can freshen up on the go. Paracetamol - Not something I normally carry around but as I've had a really bad headache this week I keep them in there. Bottle Of Water - Just so I can hydrate myself when I'm out and about. The Body Shop's Glazed Apple Lib Balm - Just so that I can prevent those unattractive chapped lips. Cherry Baby Lips - Protection for lips with a hint of colour. Tanya Burr's Champagne Toast Lip Gloss - Just to add a bit of shine and shimmer to my lips. Gloves - It has been freezing out there this week and my hands have become red raw so I popped these in so that I don't forget them when I am out. These ones are so warm and cosy! Ice Rink Price List/Winter Wonderland Maps - Just from the weekend just gone as we needed to know prices and where we were going. As well as carrying around all these essentials I also carry around my camera but I was using it to take photos for this post, my umbrella for those rainy days, an absolute must when out in Winter but it is broken so I need to buy a new one and also sometimes I carry around a book with me to read on those boring train journeys. Currently I am reading 'I Heart Paris' By Lindsey Kelk and it's absolutely amazing. Highly recommended. I also like to carry around Tic Tacs in my bag as well. The apple burst ones are my current favourites but I finished the box that was in my bag. Other than that I hope you have enjoyed this post. I know these are very popular so if you don't like them or aren't keen I hope I haven't bored you. 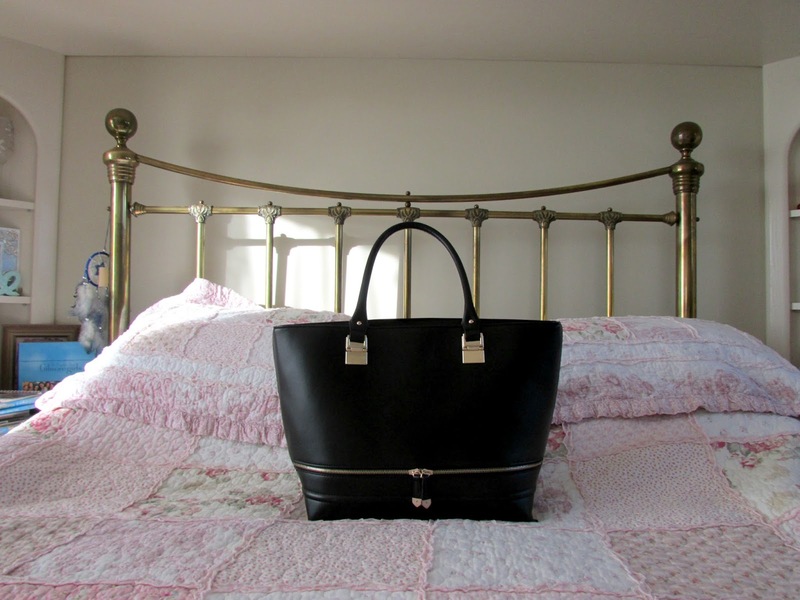 What handbag essentials do you carry around? Is there anything I should have in my bag that I don't?